The dark clouds under which we had driven yesterday eventually produced a considerable amount of heavy overnight rain. At some small hour of the morning it finally ceased and I got to sleep. The morning dawned still very murky so, for want of something better to do, we visited the nearby town of Limoux to have a nose around. Having thrown in the laptop just on the off chance, as we approached Limoux we spotted signs advertising a McDonald’s with McWiFi. It shouldn’t strictly be necessary to use McD’s since farmer Luc reportedly now has Wi-Fi but we know where we are with them so, after tromping around the very pleasant town, we went for it. The place was in serious need of refurbishment but the McWiFi and McEspressos were fine. It looks as if Steve has successfully fixed my little blogging problem; the old posts look correct now and the new posts went well. As we were in Limoux the weather began brightening dramatically and we returned to spend the afternoon in our personal nature reserve. Apart from a lake absolutely teaming with frogs and dragonflies mating, we were joined by a pied flycatcher flying sallies from several of our neighbouring poplar trees for entertainment. 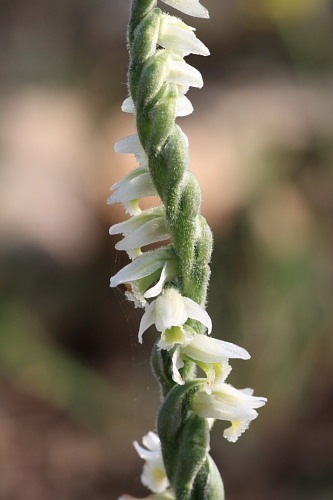 While I was off chasing dragonflies, Carol found a wild flower that fascinated her and which proved to be something rejoicing in the name of Autumn Lady’s Tresses. How poetic! It’s orchid family and has a particularly curious twist to the flower spike. After dark the normal chorus of frogs was joined by the haunting sound of what has to be the call of an owl, a call that was unfamiliar to us. From what we can determine it is either a long-eared owl or an eagle owl. Eagle owls didn’t seem particularly likely given what I thought of as their territory but they are apparently in this area. I may need to adjust my thoughts.